The place to be is “The Grove”. It’s where all the pre-partying happens. The Grove opens at 10 p.m. on Friday, and closes at midnight following the game. Expect thousands of students packed into a mini tent city. Rules for Clemson tailgating? Wear Tiger Orange, look for the pre-game parties by fraternities, and memorize the lyrics to Survivor’s Eye of the Tiger. TCF Bank stadium is the new home of the Golden Gophers. The whole area offers excellent options for fan interaction. Hit the tailgate lots, frat row, Dinky Town, or hot spots along Washington Ave.
Football fans here create an amazing atmosphere with a tent city that sprouts up around Beaver Stadium the week before a game. Check out Bryce Jordan Center and Medlar Field at Lubrano Park are open for special events before kickoff during home football games. 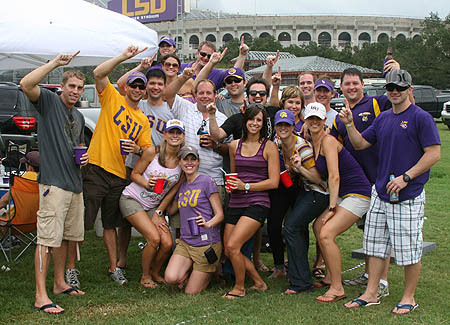 LSU fans set the standard for tailgating. The party and the food are like no other. Be prepared for street closures though. Have a campus map handy, and give yourself plenty of time to meet up with your group. A walk through the RV parking near the Schottenstein Center or Jesse Owens Stadium shows the dedication of Buckeye tailgaters. Here’s where you’ll find school buses converted into tailgating palaces and pimped out RVs blaring music. 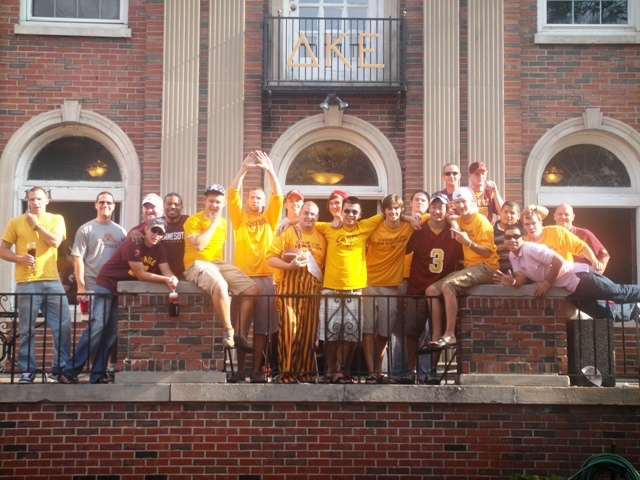 Several establishments on Lane Avenue have parties with live music and other gameday festivities. 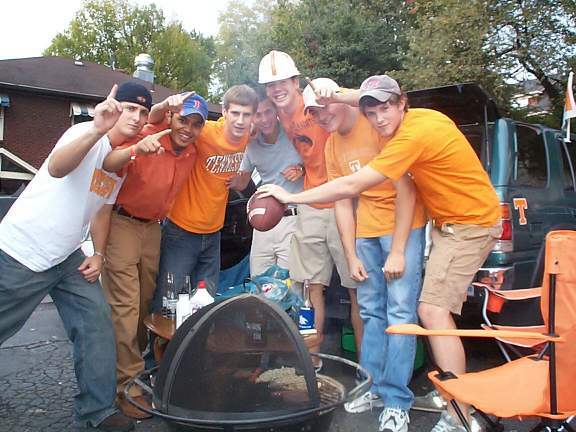 Fans by the boatload…literally. Hundreds of boats set up along the Tennessee River and fans tailgate on the water. Didn’t bring your water toys? No problem. Fans pack the parking lots surrounding the stadium too and the party rages on. Aggie football fans call themselves the 12th Man and you will find them at the Midnight Yell Practice the night before the game. It is a pep rally held at Kyle Field and draws tons of fans. Tailgating is is hosted in the northeastern parking lot of Javelina Stadium before each home football game with many student organizations, clubs, and surrounding businesses participating. 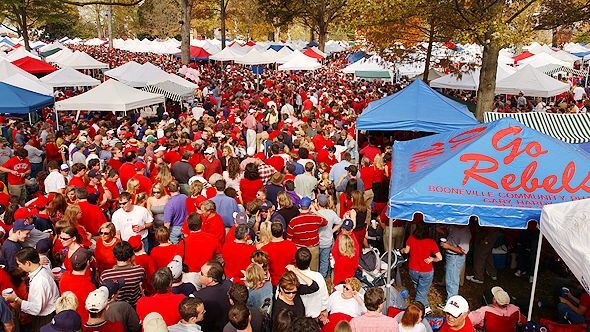 Look for the large gathering prior to each football game at the UA Quad. The school also holds pep rallies on the Gorgas library steps. The Quad has hosted ESPN’s Gameday several times and the is a where fans perform the “Elephant Stomp” to Bryant-Denny Stadium with the Alabama mascot “Big Al” and the Million Dollar Band. This is yet another school where fans drop anchor and boat-hop during pregame festivities. If the weather is bad, head towards the stadium and hit up the The north and south parking lots for a dosage of school spirit. To help kick off the college football season, we present to you a college football video montage as our video pick of the week. This video shows earth shattering hits, amazing plays, other random NCAA college football highlights from the past decade. Who knows what the next 10 years will bring us, but we do know three things: Mike Gundy is a man and he’s 40, and we love this game. Here are some runner-up videos that will entertain. While guy is leaving a voice mail for a friend, he witnesses a fender bender with an old lady. He gives his buddy a play by play that paints a funny picture. Listen here. Chris Lukawski, a longtime devotee of the Packers and beer, is confident his battered liver and family can handle another NFL season of unrestrained alcohol consumption. Watch here. Don Draper’s College Orientation. Watch here. A stirring rendition of Neil Young’s “Heart of Gold” from some Korean guy. Watch here. 1) Michigan vs Ohio State – Also known as “The Game”, the matchup between the Wolverines and the Buckeyes was ranked in 2000 by ESPN as the greatest North American sports rivalry. This game is almost always scheduled at the end of the season and has often determined the winner of the Big 10, thus determining some Rose Bowl matchups. The venue alternates between campuses every year. Michigan leads the overall series 57-42-6, but Ohio State is currently on their longest winning streak yet, as they have won the last five (2004-2008). 2) Texas vs Oklahoma – Red River Rivalry or Red River Shootout, named for the Red River which forms part of the border between OK and TX. This series has also been considered one of the best rivalries in American sports. The winner takes home the Golden Hat trophy. Texas leads the all-time series 50-40-5. The game is played at the Cotton Bowl in Dallas, considered a neutral site since its halfway between Austin and Norman. Typically it is held during the second week of October, which is during the State Fair of Texas- the largest state fair in the US by annual attendance. 3) Miami vs FSU – Since 1983, the winner of this game has gone on to win the National Championship seven times. The Miami Hurricanes currently lead the series 31-23. Recently the game has been moved to Labor Day, so it can be an exclusive game on national television. The most recent game on Labor Day 2009 was an epic battle, with seven lead changes and a nail-biting finish that ended with Miami topping the favored FSU. Thanks to my older brother, I’ve grown up a Miami fan, so GO CANES! 4) Army vs Navy – One of the more traditional of the football rivalries, it has come to represent the rivalry between the different branches of the US Armed Forces. The game is typically played in Philadelphia, somewhat of a middle ground between the two bases. 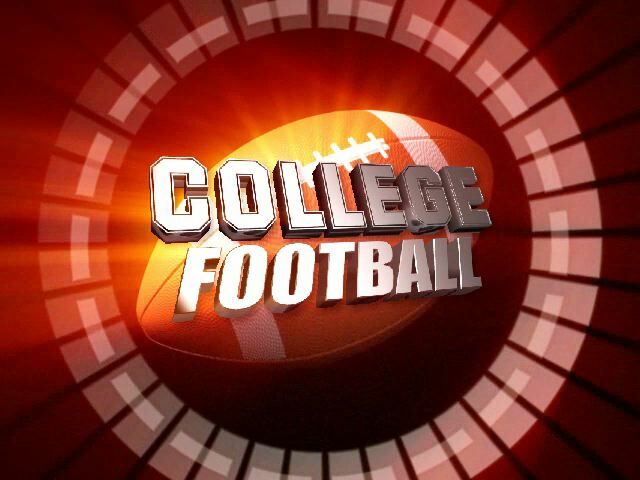 Though neither team is typically a championship contender, it is nationally televised every year due to tradition. Navy leads the series 53-49-7. 5) Alabama vs Auburn – This game is also known as the Iron Bowl. The winner is awarded the Foy-ODK Sportsmanship Trophy. The site of the game alternates between Tuscaloosa and Auburn every year, though it was played in Birmingham most of the twentieth century. Alabama leads the series 39-33-1.